Special features of the route: the route mainly passes by the stream in the wood. 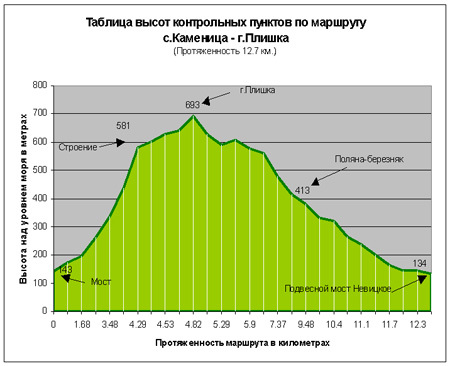 Part of the route is in front of the peak with a rapid slope. The route to Plishka mountain is the most popular in winter season, as there good skiing facilities on its slopes. There are several service buildigs on the top of the hill. It is a very suitable recreation site for many Uzhgorod residents during the weekends. However, during the summer climbing Plishka has its own special charm. For a couple of hours from the bustling city you find yourself on top of the mountain, which offers the view of open spaces of Uzhanska valley, spurs of Sinatoria and Antalovetska Poliana. The starting point of the route is railway crossing in the village of Kamyanytsia or 8-km road T 14 03. From the railway crossing the route passes to the town of Perechin along the mentined above road. 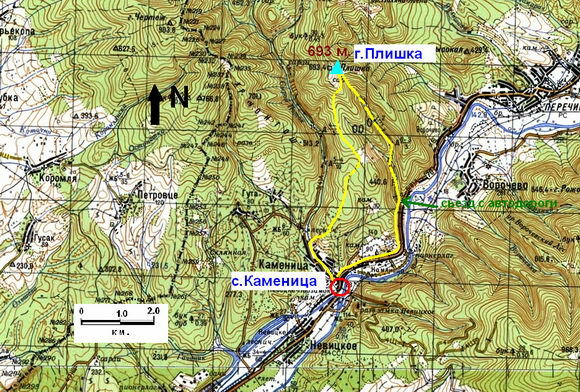 After 4 kilometers leave the main road onto a narrow asphalt road that leads into the forest at the rate of 303 °, cross the small bridge and go towards the mountain Plischka. On the opposite side of the road, opposite the branch of the road, a three-meter sign post Plischka is installed. The starting point can be reached in many ways. You can take the local train to the station, “Kamyanycia” (same as: Recreation area “Nevytske”, “Podzamkova”). Buses and taxis regularly run between Uzhgorod and Perechin to the stop “Kamyanycia”. However, we continue our journey to the top of the road through the woods along the small and noisy creek. 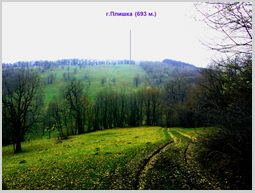 From the edge of the forest to the highest point mount Plishka is 4.8 km and about two hours of relaxed walking. We will have to rise 550 metres. The road in the woods is convenient even for a quick walk. After 1.7 km. at the first road fork you have to go strictly right to the North. Stretching 1.8 km. the road runs into a small platform from which a sharp rise of the hill starts. From here the trail goes to the Northwest at the rate of 313 ° and after 800 meters goes out into the open hillside at the edge of which there is a small ramshackle building. After passing the first building, we are heading towards a wooden house named “Skalka”. From there we leave to the left along the path (course 290 °) and after 130 meters go on a mountain road leading to the summit (273 °). It is 300 metres from crossing the path with the road to the top of the mountain. The very top is almost completely surrounded by beech forests, only the southeastern part of the slope is open and allows to view the mountain tops of Uzhgorod district and Perechyn district. At the rate of 139 ° mountain Antalovetskaya Polyana is located, 126 ° – mountain Svetilnik, 117 ° – Range Sinatoria. In the same direction, at the foot of these mountains the village of Vorochevo is situated. Open hillside is arranged with platter pull, small technical installations. The road going down from the mountain to the East, can lead you to the town of Perechyn. The returning part of the route is slightly longer than the first phase of the way, but passes through more gentle slopes. From the top we are going down in the direction of the wooden house, located to the right of the forest (the rate is 132 °), then go onto a forest road and deep into the wood (218 °). After 2 km we pass the road fork towards the main road (124 °). Passing these 800 meters,we come to a large meadow, surrounded by young birch trees. The road goes down all the time , winding between the trees and comes to the next the road fork. Holding the course 231 ° after 0.5 km we pass by a high stone embankment. Further, the forest road goes into asphalt. After about half a mile down the road we go to the edge of Kamyanytsia career. Further we go down the steep, winding road to the turn of the road to ninety degrees. At this point we go to the right off the road to the path (224 °), which runs through the young wood. After 300 meters the footpath goes to another asphalt road that leads to the village of Kamyanycia. From this place to the starting point of the route (the railway crossing) it is just 1 km. The streets of the village can easily lead you to the right place.